All the NT manuscripts were written in the first century! 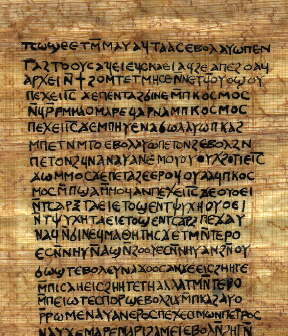 The Gospel of Thomas is Scripture, or, it is not! The Gospel of Thomas and other “Gospels” came much later than Matthew, Mark, Luke, and John. Much, later, after the first century. One of the standards for a book to be canonical is that it was written by a prophet, or apostle, or came from with the apostolic circle. For a New Testament book to have been written from someone within the apostolic circle, clearly it would have had to have been written within the first century. Mark wasn’t an apostle but he knew the apostles and relayed Peter’s message. Luke wasn’t an apostle, but he knew the apostles and traveled with Paul. James, well, he was the brother of Jesus, but he was in the inner circle of the apostles, made evident as he was present at the first “Church Council” in Acts 15, and seems to have had the final word at that meeting quoting Scripture to provide his verdict! The first fact shared that Canon Fodder shares in this series of ten facts is that every Christian should know that the New Testament is the earliest Christian writings we possess. Hence, the reason I ranted about the Gospel of Thomas and the early writing of the NT manuscripts. Read the blog and you’ll get more details. Previous Post Jesus had a twin brother! Sort of like the movie, The Illusionist? Next Post “Jesus could have had a twin brother.” – the script. Andy, what are your thoughts on Deuterocanonical books? Do you think it is right for Orthodox and Catholics to embrace it? As I understand it they are rejected by Jews and us Protestants because they are survived only in the Septugiant and not the original Hebrew, thus they had to be written after the Jewish timeframe of true prophecy(after the Ezra-Nehemiah timeperiod). But doesn’t the Macabees then provide a historical gap between Malichi and Matthew? I was wondering your scholarly opinion on this. I’ll write a blog post on this soon. A Roman Catholic just asked me why we have different Bibles, so it’d be good for me to have a solid answer. My understanding is that the Jews at the time of Jesus did not consider the Deuterocanonical books to be Scripture, and since Jesus accepted the Jewish Scriptures and quoted them and affirmed them to be God’s Word, we stick to what Christ approved. We have access to the Jewish texts of that time through Josephus (I’m pretty sure, but not certain). Jews today don’t have the Deuterocanonical books in the Tanakh, so why do Roman Catholics have them? As for the Orthodox, I’m pretty ignorant on a lot of their doctrines. I need to get caught up to speed on those too. Another element would be that canonical books were written by prophets or apostles, or were produced within the apostolic circle. The Deuterocanonical books don’t fit that standard. That’s shooting from my hip right now without doing any investigation. Thanks I value your opinion as you’ve said before all of this preparation is important for evangeliziing the authority of the Word when needed. I’m a lay person so I haven’t done any in depth research but I know the claims are “culturally OT manuscript driven” so to speak. A Hebrew/Masoretic preference vs a Greek/Septugiant preference based on cultural theological and historical trust of the authenticity of the manuscripts and there is a correlation to the Great Schism. I can’t remember dates but key points in time where when they were dropped from the Tankh since it did originate in Hebrew before being translated for the Septugiant, the Great Schism, when the Protestant canon was established. Okay, look forward to your post about this one day! I’m a layman too, and I have not spent much time on why the Roman Catholic Church has additional books. I had ever heard was that the additional books were not accepted by the Jews of Jesus’ day as being Scripture, which goes a long way for any follower of Christ to say that they are in fact, not Scripture! I also know that they weren’t considered canonical when the NT canon was first accepted, even though the Church knew about the books and had access to them. From what I have read on several sites so far is that the additional Roman Catholic books weren’t considered canonical until 1546! Very, very late. Apparently there are historical inaccuracies or inconsistencies in such books and I have read some examples about it since you have asked this question. They are not prophetic by nature either. This alone seems like enough for me to reject the books as being Scripture.